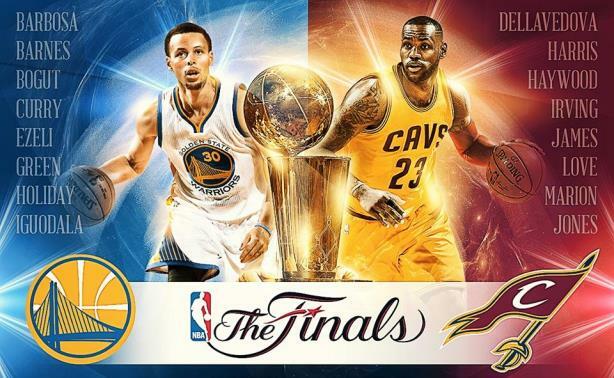 LeBron vs. Steph Curry in the NBA Finals means a win for marketers. Yet they must be careful in how they use social media. Look for marketers trying to score during the NBA Finals to use two moves: leveraging star players LeBron James and Stephen Curry and integrating relevant content into their social media strategies. The Golden State Warriors and Cleveland Cavaliers will face off in the first game of the series on Thursday night. The 2014/15 edition of the Finals is drawing "intense interest" among fans and non-fans alike because of the compelling matchup between the Cavaliers’ James and Warriors guard Curry, says Dan Gadd, director of digital strategy at Taylor. Both players have résumés that are turning the heads of even casual basketball fans, he adds, such as James "basically carrying the team on his back" through the NBA Playoffs, and Curry’s ascension to become this season’s MVP. Curry also recently received a ton of media attention for bringing his two-year-old daughter to post-game press conferences. James, who returned to Ohio to play for the Cleveland Cavaliers this year after a four-year stint with the Miami Heat, is making his fifth consecutive trip to the NBA’s championship series; it’ll be the first for Curry. "It’s obviously never just one player versus another," explains Gadd, "but there’s definitely a mano a mano thing going on with Curry and [James] that people are interested in." Both players have tremendous endorsement value and numerous sponsors, notes Matt Saler, director of sports marketing at Imre. Basketball challenger brand Under Armour, which launched a signature shoe line with Curry this year, is "capitalizing on the success of him being a marquee player in the league," he adds. The brand has the chance to seize the moment during the Finals and disrupt the basketball space by going up against much larger rival Nike. Saler says: "Under Armour has been banking on [Curry’s] dominance to reach a more urban market and really grow its foothold within the basketball category." Curry’s other endorsement deals include State Farm, Express, Kaiser Permanente, MuscleMilk, Unilever ’s Degree, and Backyard Sports. He also ranked second behind James in jersey sales this season. James, meanwhile, has the most endorsements of any NBA player, with deals from Samsung, Kia, Nike, McDonald’s, Coca-Cola, Beats by Dre, Upper Deck, Tencent, and Audemars Piguet. "On both a national and global level, the ability to align yourself with an athlete of [James’] magnitude can really work wonders for your brand and create unique opportunities, and the same goes for Curry," says Saler. Even though James is recognized as "one of the absolute kings of the sport," Curry is driving more mentions on social media, explains Gadd. James has gone silent on social media for the playoffs, and Curry and his story also draw significant interest from fans. Regardless of the players or teams with which brands are aligned, Gadd says incorporating social media into a comms strategy is vital for reaching a basketball audience. "The TV ratings are great, but last year’s NBA Finals games only drew a third of the TV audience that even the NFC Championship did in the NFL, but the social gap is much smaller than that," explains Gadd. He adds that on a person-by-person basis, the games are driving major social media activity, so brands have to be smart in how they try to connect with fans during the games. "You can’t repurpose something you’ve done somewhere else for an audience that is very passionate about this topic," Gadd says. "You have to spend a lot of time evaluating the audience and the mindset and what they actually care about and will react to during the games." Good relationships with the teams and players are important for brand sponsors during an event such as the NBA Finals, notes Chris Brienza, SVP and head of the New York office at Coyne PR. He adds that having a rapport with the teams’ social media managers is also beneficial. When it comes to posting content on social media, Brienza says brands have to be "quick-witted and able to take advantage of things as they happen, but not in a cheap way." Social engagement must add value and offer meaningful content in order to build relationships with consumers, he says. A word of warning: brands should be wary of launching contests, promos, or online sweepstakes, says Brienza. "The game itself – that two-and-a-half-hour window – is fairly sacred," he explains. "You don’t want to impede upon it, so if you can do something before and after that’s meaningful, then that will be key." Saler echoes Brienza’s sentiments, saying the NBA Finals draws a unique demographic, one that’s younger, more diverse, and more social-media-savvy than the World Series or the Stanley Cup Finals. Fans are particularly involved in Twitter and Instagram, he adds. If a brand has a relationship with a team or player, it makes sense to plan content in advance and post it throughout the week before or day of a game to build excitement, Saler says. In the build-up to the series, some brands have already leveraged their own social content well, says Sandra Carreon-John, MD at M&C Saatchi Sport & Entertainment, who previously worked in senior roles at the NHL, ESPN, and with the NBA’s New York Knicks. Social initiatives that stand out to her include State Farm’s #AssistoftheNight and PlayStation’s #PlayoftheGame efforts. NBA sponsor Taco Bell also shows off end-of-game highlights with the #BuzzerBeater hashtag. While it’s a favorable matchup for brands, Carreon-John says "the NBA will be the real winner" at the end of the seven-game series. "The league has had an incredible year, and you can go back to the decisive and unambiguous way Commissioner Adam Silver handled the [Donald] Sterling crisis, right up to a very successful All-Star Game in New York City, which generated more than $200 million for the city," she says. Social media will also be key for the NBA itself. Carreon-John adds that she’s been impressed with its use of Facebook Live, where it interviews players and allows fans to ask questions, as well as its integration of Facebook’s conversation map about its top players. She notes that a Finals pitting two of the NBA’s biggest stars against each other is the perfect culmination for the league, which uses a player-centric marketing approach. "I don’t think you could have scripted it any better if you tried," she says.